Wood Decking - Traditional - Deck - Grand Rapids - by Woodwork Specialties Co. 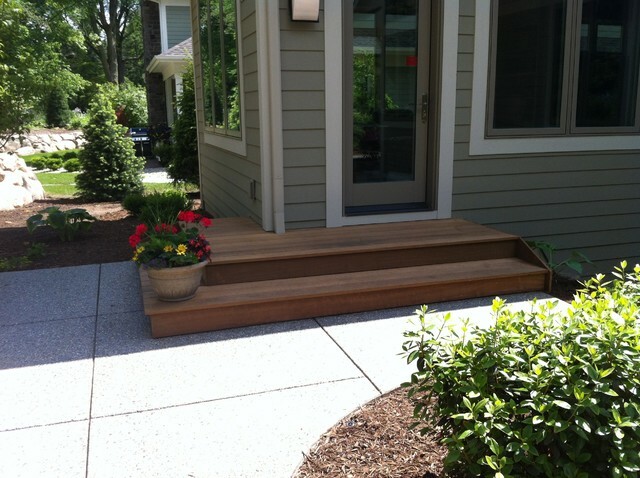 Stepping down into the backyard patio, Ipe decking provides a comfortable transition. HardiePlank cedarmill lap siding protects for the specific climate where this home is located and provides a beautiful exterior. Rough sawn cedar trims the door, windows, and corners of this home. Woodwork Specialties... Your Custom Resource. Follow us for more ideas! Shallow steps. Patio surface. Room for plants.